For most of the afternoon France's handling was not of the level we expected, they lacked tactical vision and the tackling was not as effective as it should have been, but they ended up winning. They did it by scoring five tries to four. So put a hold on orbituaries for French rugby: they are not kicking yet, but are still alive. After more than two years they finally managed to break the jinx and win in their own Stade the France. Much of their thanks must go to Italian flanker Walter Cristofoletto who had a day of madness: first he was sin-binned after thirty minutes of the first half for arguing with a referee decision and then was sent off for good for stamping in the 59th minute. During Cristofoletto's first spell in the sin bin France scored ten points taking them from 10-17 down to a 20-17 lead. With Italy one man short, France added twelve more points to their tally and, surprisingly gave away 14 but it was enough to seal a 42-31 victory. "No joking", The French press had warned in the papers this morning. They probably knew that on April fool's a small reminder would not go amiss. Italy started well and in the second minute Diego Dominguez, on his last international appearance, had the chance to put Italy ahead by kicking a drop goal which he just pushed wide. France answered by setting up camp in the Italian twenty two for a good five minute and the sustained pressure led to Italy giving away a penalty which Dourthe converted into three points. It was France's only flash of genius in the first 25 minutes. On a wet and gloomy afternoon Troncon and Dominguez's kicking were timely and perfect and Italy always looked dangerous with the ball in their hands and much more disciplined than in the previous games. First Dominguez lost the ball diving over the line after heavy pressure by the Italian forwards near the French try line. Then it was the Argentinean born fly half to level the score with a gently struck drop goal and in the 17th minute centre Luca Martin broke through for five points after a powerful charge by the Italian pack. At that time Italy looked in perfect control of the game while the French tackling left a lot to be desired and their handling patchy. On the 25th minute France scored their first try by fly half Alain Penaud but two minutes later Alessandro Troncon quickly leapt from a ruck, dummied and conned the whole of the French defence and put Italy back in the lead 15-10. Dominguez converted to give his team a temporary seven point cushion. On the 31st minute France got the boost they needed to get back into the match: flanker Walter Cristofoletto protested referee Mr. Pablo De Luca sent him to the sin bin. France moved up a gear and full back Thomas Castaignede was awarded a try which he probably did not touch down after diving over the ball which had already slid out of play. The first half ended with France 20-17 in the lead. The second half opened with France producing some furious attacking: Pelous scored on the fifth minute, Dourthe converted and, a few minutes later, he extended their lead to 30-17. Then Cristofoletto was shown the red card and the game was virtually over. But before the end there were still two tries apiece to come. Benazzi and Pelous scored for France and Mazzucato and Troncon crossed the line for Italy. France was happy to get their first victory at the Stade de France after five consecutive defeats, Italy on the other hand did not have such a bad landing after their first long distance flight in the Six Nations after a bit of bumpy air along the way. 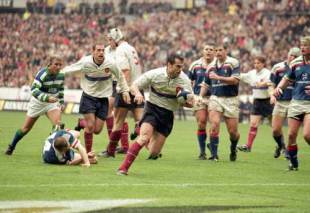 Diego Dominguez's walk out was cheered by both Italians and French fans and with that the Six Nations 2000 is over.